Message: Hello, My Name is **** and I am a builder who is working on a new building in Warwick. 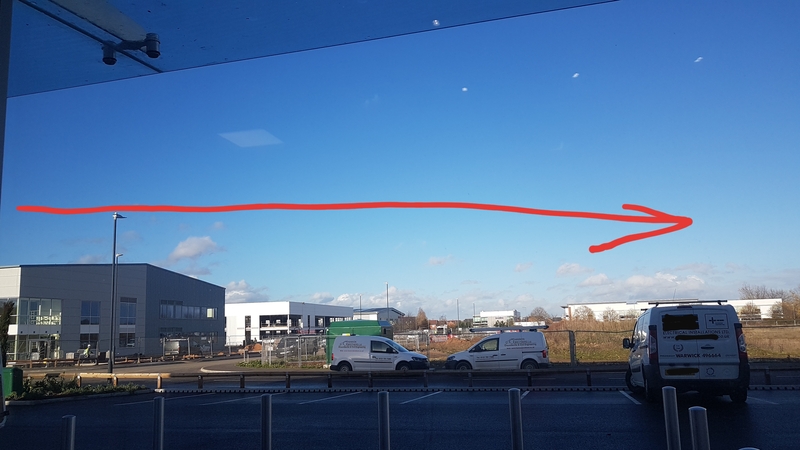 On the afternoon of the 1st of November I spotted a small dark speck in the sky through the window of the reception area of the building we are working on. It was travelling from left to right from my perspective and traversed the sky from what I would describe as from 1 horizon to the other, as far as we could see from our position. It was also seen by my work colleague who is older and had a hard time focusing on it to start with. By the time he could see it and we discussed what it could be (and not!) it was moving out of view so I went through the warehouse and started to film it from the rear fire exit door. I used a Samsung S7 and sorry for the bad quality as I had to zoom in to get it to show. I would estimate the object to be about the size and shape of a barrel (a large oil barrel or drum) about 3ft to 1 metre wide and about twice as high. It `seemed` to keep on a level course (although it looked like it started to descend just behind the tree line at the end?) but that could be an optical illusion? Also it `seemed` to stay perfectly upright or perpendicular to the ground, so in my mind, it seemed unlikely it was a balloon. I checked flight tracking websites to see if they showed anything and there was nothing close at that time (although the planes do fly right overhead on the flight path to Birmingham airport) but this seemed to cross over their usual path. We also discounted a drone due to the shape and also the distance seemed to great across main roads and lots of different commercial properties. The only other thing we thought it could be is a Microlight but it didn't look like one and no noise was observed and I know from experience microlights are very loud and can be heard for miles before and after passing overhead. One viewer has written in and said that "from the way the tree tops are bending over from right to left as we view it, I would say what ever that is it's going against the wind!"